Singapore Airlines relaunched nonstop service from Singapore to New York last fall. 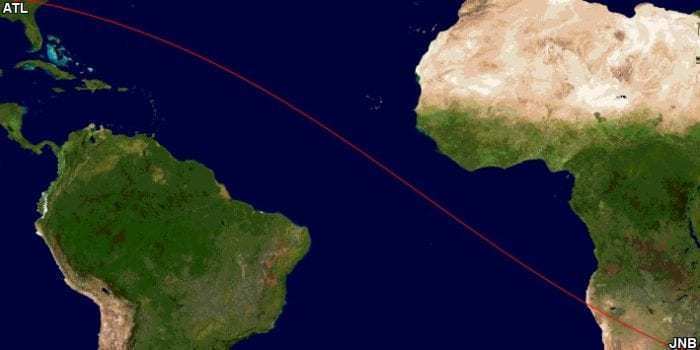 At this point, this is the world’s longest nonstop commercial passenger flight. Nonetheless, there are other passenger flights that are pretty long as well. Let’s take a look at the ten longest ones. First of all, as mentioned above, we have Singapore to New York, or, more specifically, Singapore Changi Airport (SIN) to Newark Liberty International Airport (EWR). 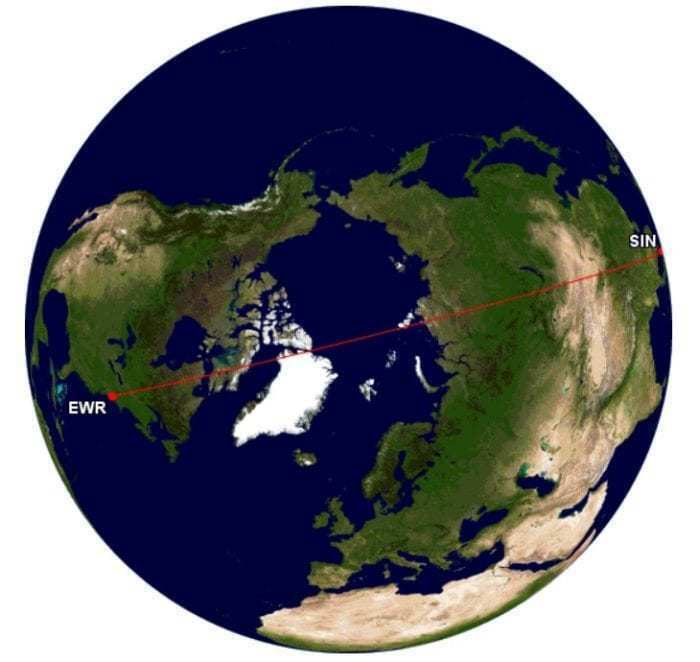 At present, SIN to EWR is the world’s longest commercial passenger flight. Source: Great Circle Mapper. This flight covers a distance of approximately 15,350 km in about 18 and 1/2 hours. Singapore Airlines uses an Airbus A350-900ULR on this route. Interestingly, there are no Economy Class seats on this flight. Instead, the airline offers seats in Business Class and Premium Economy only on its nonstop between Singapore and New York. Singapore Airlines’ Airbus A350-900ULR can transport up to 161 passengers between New York and Singapore. Photo: Singapore Airlines. Secondly, there is Qatar Airways‘ flight from Doha’s Hamad International Airport (DOH) to Auckland Airport (AKL). At a little over 14,500 km, this flight is actually quite a bit shorter than Singapore Airlines’ flight. Nonetheless, travelers will still spend about 16 hours and 30 minutes in the air. 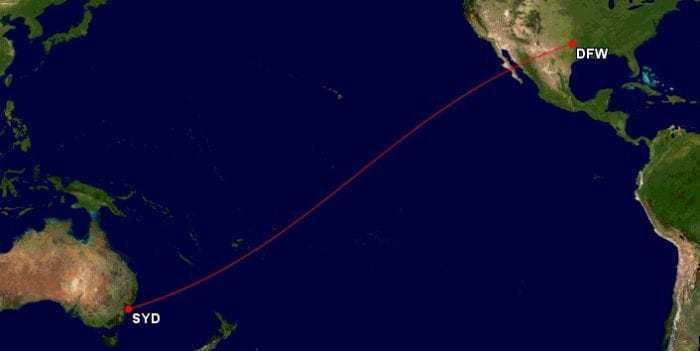 DOH to AKL held the title of the world’s longest commercial passenger flight for over one year. Source: Great Circle Mapper. Qatar Airways uses the Boeing 777-200LR on this route. Qatar Airways currently has 25 Boeing 777-200 aircraft in its fleet. Photo: Wikimedia. Qantas’ flight from Perth Airport (PER) to London Heathrow (LHR) comes in at number 3. It is only barely shorter than the Doha to Auckland flight and covers a distance of 14,499 km. The flying time is typically around 17 hours and 30 minutes. Presently, PER to LHR is a close number 3. Source: Great Circle Mapper. 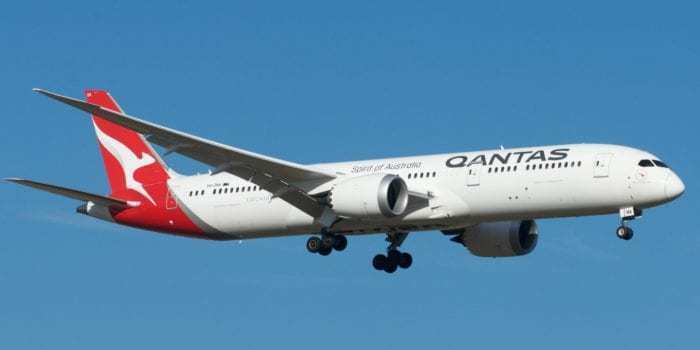 Australia’s flag carrier operates one of its Boeing 787-9 Dreamliners between Australia and London. Qantas Boeing 787-9 features 42 seats in Business Class, 28 seats in Premium Economy, and 166 seats in Economy Class. Photo: Wikimedia. The fourth longest commercial passenger flight is Dubai International Airport (DXB) to Auckland Airport (AKL). Of course, this 14,200 km flight is offered by Emirates. Emirates started nonstop service to Auckland in March of 2016. Source: Great Circle Mapper. The airline operates an Airbus A380-800 on this 15 hour and 45 minute flight. 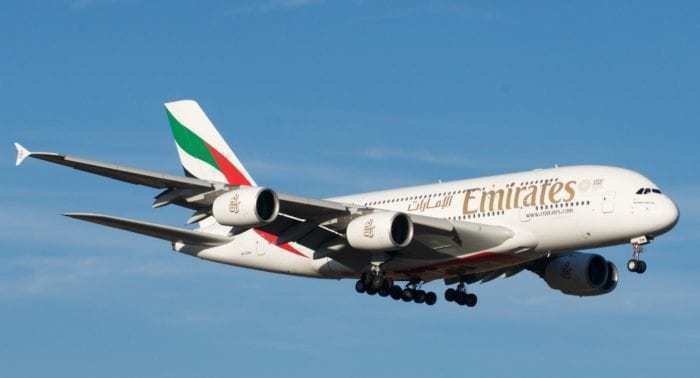 Emirates is the largest Airbus A380 operator. Photo: Wikimedia. The Singapore Airlines nonstop flight between Singapore Changi (SIN) and Los Angeles International (LAX) is also relatively new. As a matter of fact, the airline just started nonstop service between the two cities last November. 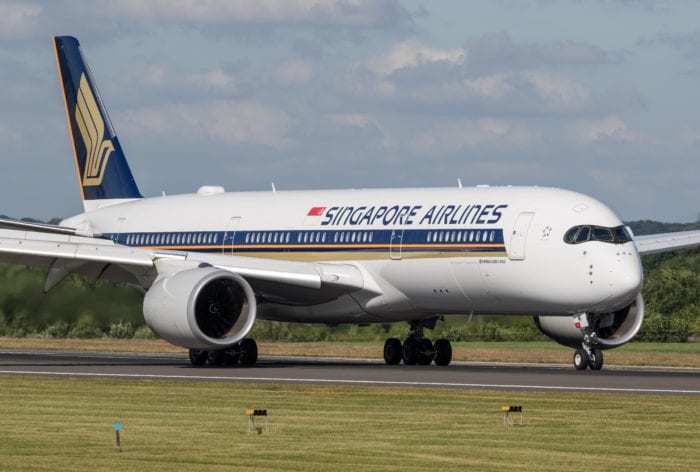 Previously, Singapore’s flag carrier connected the two cities with a stop at either Tokyo Narita (NRT) or Seoul’s Incheon International Airport (ICN). Singapore Airlines operates the Airbus A350-900ULR on this route as well. SIN to LAX is Singapore Airlines’ second-longest commercial passenger flight. Source: Great Circle Mapper. The distance between Singapore and Los Angeles is about 14,100 km. Travelers arrive at their destination after a 16-hour flight. Next up, we have United Airlines’ Boeing 787-9 Dreamliner flight between Houston’s George Bush Intercontinental Airport (IAH) and Sydney Airport (SYD). United Airlines Boeing 787-9s offer a total of 252 seats. Photo: Wikimedia. At a distance of 13,830 km and a flying time of 17 hours and 30 minutes, it is still a pretty long flight. United Airlines’ flight from Texas to Australia comes in at number 6. Source: Great Circle Mapper. The seventh-place goes to Qantas. Its flight between Sydney Airport (SYD) and Dallas/Fort Worth International Airport (DFW) covers a distance of approximately 13,800 km and takes 15 hours and 30 minutes to complete. At the present time, we have another flight connecting Texas with Australia in seventh place. Source: Great Circle Mapper. This flight is operated on an Airbus A380-800. 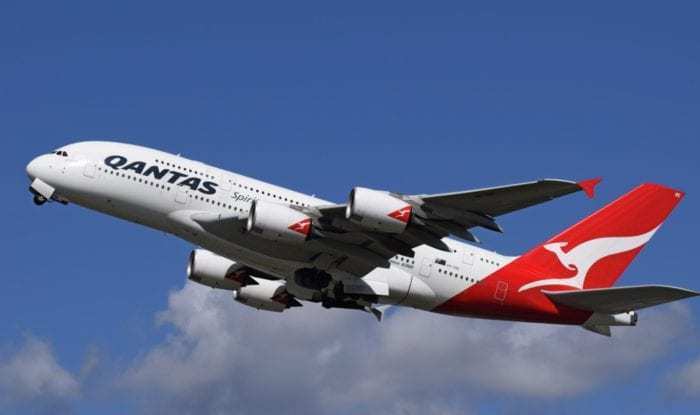 Qantas is in the process of refurbishing its A380s. Photo: Wikimedia. Philippine Airlines’ flight between Manila’s Ninoy Aquino International Airport (MNL) and New York’s John F. Kennedy International Airport (JFK) is another fairly new flight. As a matter of fact, the airline just started service on this 13,700 km route last October. If you decide to travel nonstop between the Philippines and New York, you can expect to spend about 15 hours and 35 minutes in the air. Philippine Airlines also made our list with its long-haul from MNL to JFK. Source: Great Circle Mapper. Philippine Airlines’ passengers travel on an Airbus A350-900 between the two cities. Philippine Airlines’ Airbus A350-900 can carry up to 295 passengers. Photo: Airbus. 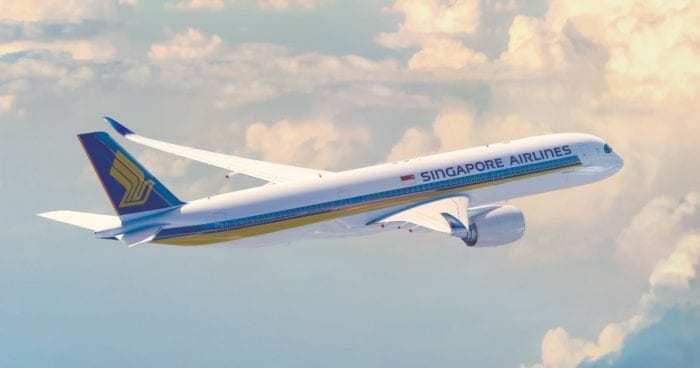 The ninth longest commercial passenger flight, San Francisco International Airport (SFO) to Singapore Changi (SIN), is offered by two airlines. In fact, Singapore Airlines and United Airlines transport passengers nonstop on this 13,580 km route. Another United States to SIN flight is the ninth longest commercial passenger flight. Source: Great Circle Mapper. While Singapore Airlines once again uses the Airbus A350-900ULR for this flight, United Airlines uses the Boeing 787-9 Dreamliner. Singapore Airlines’ passengers will arrive at their destination about 20 minutes faster than United Airlines’ passengers (16 hours and 40 minutes vs. 17 hours). Last but not least we have Delta Air Lines’ flight from Hartsfield-Jackson Atlanta International Airport (ATL) to Johannesburg’s O.R. Tambo International Airport (JNB). 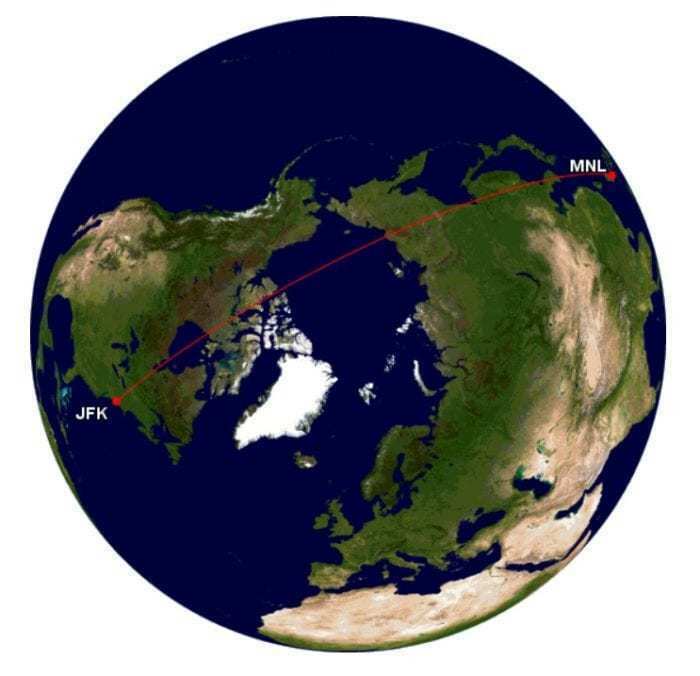 This 13,580 km flight has a flight time of 15 hours and 15 minutes. Finally, we have ATL to JNB in 10th place. Source: Great Circle Mapper. 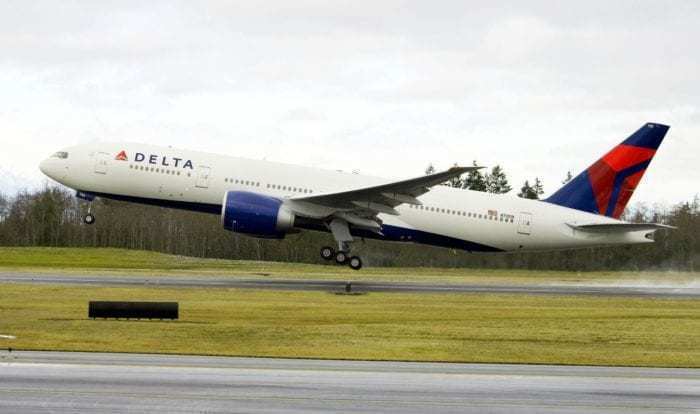 Passengers can expect to travel on one of Delta’s Boeing 777-200LR aircraft. Delta’s Boeing 777-200LR aircraft accommodate up to 296 passengers. Photo: Delta. 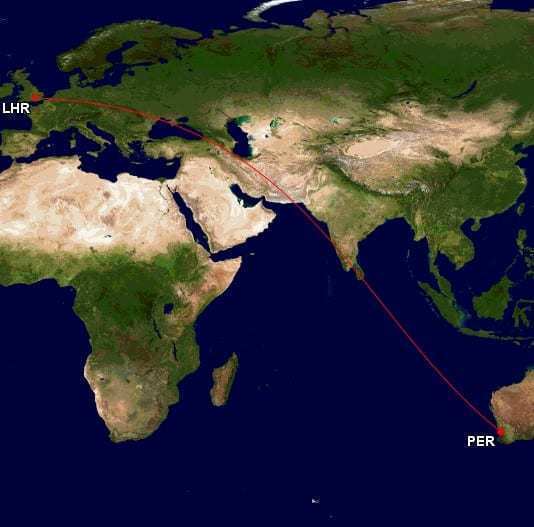 Have you ever flown on any of these ten longest nonstop routes? Share your experience with us. So an extra 30km to Houston from Sydney takes an extra 2 hours? The added flight time is actually not because of the extra 30 km. The flight from Texas to Australia is about 2 hours longer than the flight from Australia to Texas. 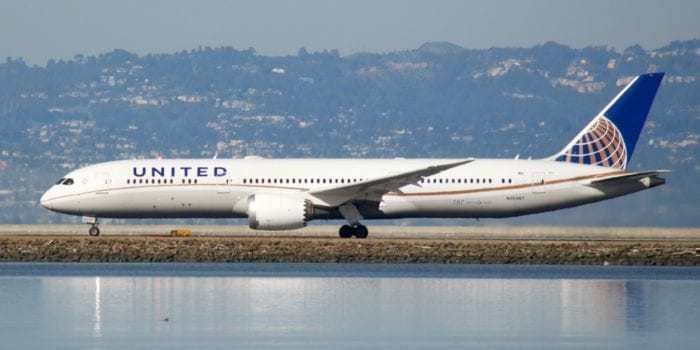 What about United Airlines flight between San Francisco and Singapore which is typically 17 hours of flight time…or the Air New Zealand flight between Auckland and Chicago?